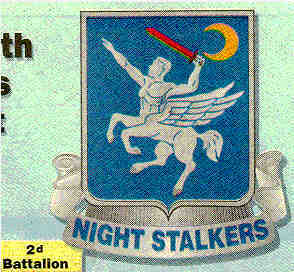 The crest of the 160th Special Operations Aviation Regiment (Airborne), 1st Battalion, portrays a black robed warrior holding a scarlet saber over his shoulder riding the winged horse of Greek mythology. 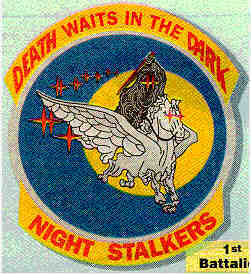 These two are shown against a full moon in a dark sky; warrior and winged horse both have starburst eyes. The 160th Special Operations Aviation Regiment (Airborne) is a helicopter unit whose sole purpose is to deliver and pick-up Special Operations commandos at the site of the intended hit. It is based in Ft. Campbell, Kentucky, Hunter Army Airfield, Georgia, and Panama (Army Times, July 10, 1995). It was almost certainly this regiment that flew the black helicopters over Mt. Carmel on February 28, strafing the women's and children's quarters with machine gun fire. 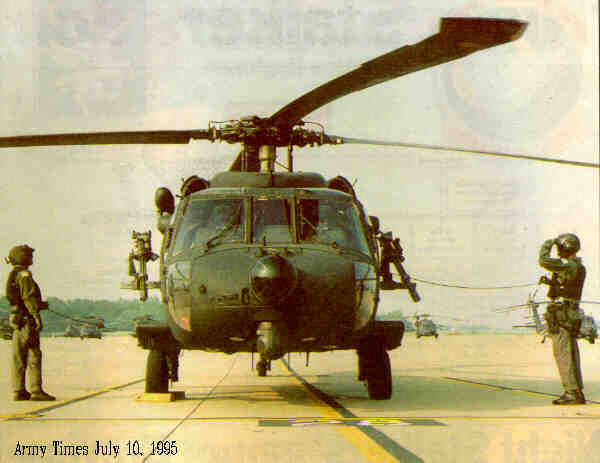 The missions of the 160th are secret and often flown at night; not surprisingly, its helicopters are painted black and carry no insignia (Army Times, July 10, 1995, pg. 13 and pg. 14). 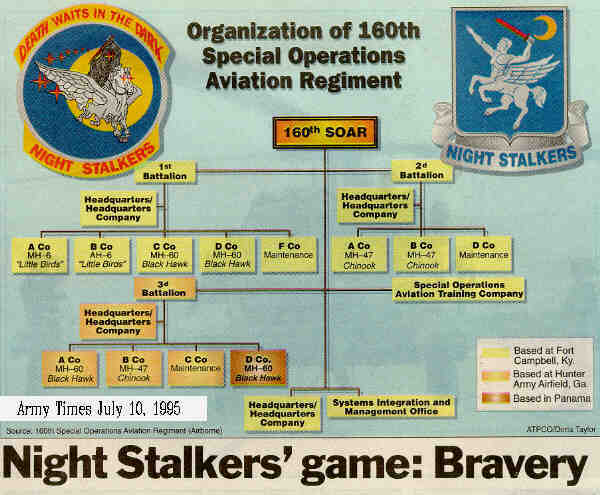 Members of the 160th call themselves the "Night Stalkers." "Death Waits in the Dark" is their motto. Both the 1st and 2nd Battalions have emblems mixing Greek mythology with the occult. The crest of the 160th Special Operations Aviation Regiment (Airborne), 2nd Battalion, portrays a warrior whose upper body is human, and whose lower body is a winged horse. This warrior holds a scarlet saber in his left hand and points with his right. Over his shoulder is a crescent moon. 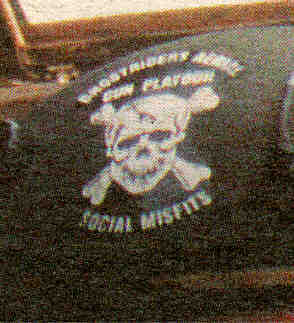 The cover picture on the Army Times, July 10, 1995, magnified here for visibility, shows a pilot's helmut with the image of a cracked skull and crossbones and the words, "Ghostriders Aerial Gun Platoon—Social Misfits." The psychological operations units for the US military would have us believe these men are self- sacrificing heroes sworn "to protect the Constitution from all enemies, foreign and domestic," hearts afire with ideals of liberty, fighting for peace bought by courage and victory. But apparently the self-image of this soldier, and possibly of all the men of his unit, is more akin to pirates, sociopathic bikers, and street gangs. Special Ops, it seems, is where an axe-murderer can practice his hobby without fear of arrest. The 160th Regiment was the subject of close scrutiny in the American Justice Federation video America Under Siege. After this exposure and the two Waco videos produced by AJF, the 160th was forced to come out of the closet. 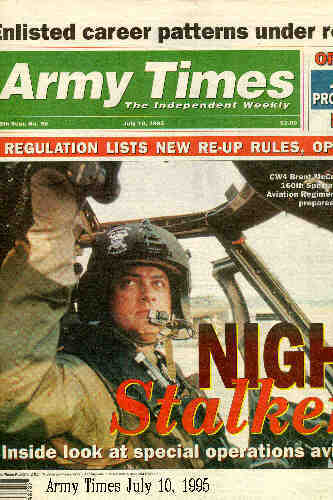 The July 10, 1995 Army Times carried a cover story on the 160th (Army Times, July 10, 1995 cover). Several photos of the 160th's black helicopters appear in that edition, as does the organization board and the emblems. The US military for many years has positioned a life in the military as a "professional" choice, with medical and educational benefits, travel, and handsome retirement pay. In questionable honesty, the appeal is aimed at candidates' self-interest. In marked contrast to the age of World War II, the subject of worthy patriotic sacrifice is almost never mentioned. After the failure of the Marine helicopters to perform in the Iranian hostage rescue fiasco, Delta force founder Col. Charlie Beckwith wanted to establish a helicopter unit dedicated solely to transporting the Delta force. He described the men he wanted: "Aces, daredevils, barnstormers, guys who flew by the seats of their pants, hot-rodders, pilots who could pick it up, turn it around on a dime and put it back down with a flair." That is, Beckwith was looking for thrill seekers who live on the edge. Thus the 160th Airborne was born. Beckwith's words were quoted by writers Frank Greve & Ellen Warren in a series of articles they wrote for the Knight Ridder news service. The articles appeared in the Philadelphia Inquirer, December 16-17, 1984, under the title "Secret US Unit in War Zone." Warren and Greve also cites one of the nation's top military helicopter safety experts who examined partial reports of some of the 160th's fatal accidents. After his inspection, the expert called the 160th maintenance program "atrocious." Disregard for personal safety is of course part of the thrill seeker's mind set. The same appeal to thrill seekers who live on the edge appears in an ad placed by the Army National Guard in the Non Commissioned Officers Association Journal of August/September, 1996. The ad offers potential guardsmen "action and adventure," but promises that they will "still make it home for dinner" — after killing people? 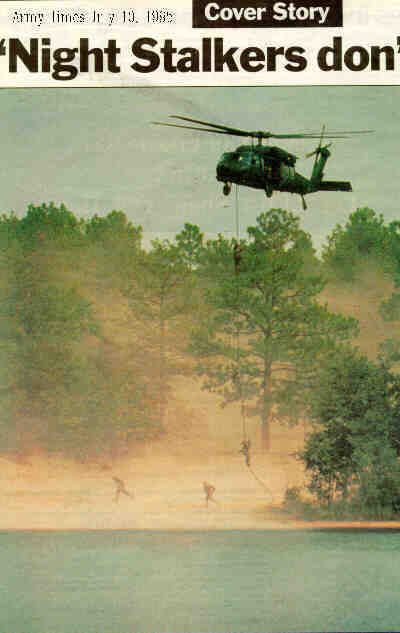 The ad shows faceless commandos disembarking from a black helicopter, as flown by the 160th Special Operations Aviation Regiment (Airborne). With the July 10, 1995 story in the Army Times (cited above), we can see the change of purpose has come full circle: Special Ops, with its death cult images and mottos, is presented in Madison Avenue hype as the creme de la creme of warfighter achievement. The members live in danger and adventure, they glory in a devil-may-care disregard for personal safety, and they see regular combat action. "Risk of death is a constant companion for 160th SOAR (Special Operations Aviation Regiment)," boasts the Army Times. Sometimes Special Ops personnel who are on covert missions become injured and cannot be retrieved and given medical assistance. These people are left behind — but killed first by their own comrades who decapitate the body and remove the hands to prevent identification. This information comes to the Museum from an unofficial source through the medical personnel of Special Ops. These medical personnel have special duties to administer drugs (uppers) to commandos to enhance their performance and depress the desire for sleep while on mission. When the mission is over, other drugs (downers) are administered to bring the commandos down. We now come to another practice of the US military and especially Special Operations: Body laundering, sometimes called "body washing." When Special Ops personnel die on secret and illegal missions, a problem is created for the military bureaucracy. The military cannot tell the families how the serviceman died, so the body is "laundered." That is, a cover story is invented to explain the death, and the body of the dead soldier is mutilated in such a way to corroborate the cover story. Journalists Frank Greve and Ellen Warren wrote of the practice in their series which appeared in the Philadelphia Inquirer on December 16 & 17, 1984 (cited above). According to the article, during the Vietnam War, soldiers were killed while on CIA secret missions in Laos and Cambodia. "If a guy was killed on a mission, and if it was sensitive politically, we'd ship the body back home and have a jeep roll over on him at Fort Huachuca," one former officer told the two Knight-Ridder writers. Ft. Huachuca is a covert operations base in Arizona. "Or," the former officer said, "we'd arrange a chopper crash, or wait until one happened and insert a body or two into the wreckage later. It's not that difficult." And the secret Special Ops helicopter unit, the 160th Task Force, almost certainly laundered the bodies of its servicemen when they were killed in El Salvador. The widow of a 160th pilot who died in a crash reported that her husband told her just days before his death, "If I ever die in an accident and they tell you I was a spy, or if I crash somewhere that I'm not supposed to be, don't ever believe that I was spying or wasn't working for the Army," according to Greve and Warren (Philadelphia Inquirer, December 16, 1984). A cousin of another deceased member of the 160th Task Force said that two weeks before his death, the man told her that whatever happened to him, "the Army could pull whatever they wanted to make it look other ways." (Philadelphia Inquirer, December 16, 1984). According to the Greve and Warren article, fines, imprisonment, and loss of rank can result from breaches of security by military personnel. "That's in the top-secret category, so I'm not going to talk about that," said one Army airman familiar with the Central American missions. "I don't want to go to jail." The Washington Post, May 6, 1996 (Public Honors for Secret Combat) described body laundering during the El Salvador operation. Many who knew the truth about the circumstances surrounding the soldiers deaths were troubled by the outright false official reports relatives received, says the Post. Judy Lujan, wife of Army Lt. Col. Joseph H. Lujan, was told her husband died in 1987 when the helicopter carrying him crashed into a hillside during stormy weather. But the Army never produced her husband's personal effects or photographs of his corpse, despite her repeated requests, she said. "I can't get on with my life, I can't do anything, until I know for sure he's dead." Relatives of Gregory A. Fronius, a 28-year-old Green Beret sergeant, know he was slain during a guerrilla attack on a Salvadoran brigade's headquarters at El Paraiso. But initially they were informed Fronius had died in his barracks when a mortar shell struck. In fact, Fronius had bolted from the barracks and was trying to rally Salvadoran soldiers for a counterattack when several guerrilla snipers shot him, then blew up his body with an explosive charge. Insight on the News, January 29, 1996 reported that one of the magazine's Special Ops contacts was predicting bodies would be laundered as a result of the Bosnian "peacekeeping" mission. With many Special Ops personnel operating in Bosnia, some of their missions will likely be extremely sensitive and high risk, with plausible deniability built into them, said the source. "When their bodies come home, they will be identified not as soldiers, but as businessmen or members of nonmilitary government agencies. The truths about their deaths will be difficult to learn," says author Anthony Kinnery.